Lionel’s father was called William Harris. He was born in 1828, apparently in Germany, and died on the 3rd April 1907. William was soon living with other Harrises in London however, and he married Eve Barnett on the 21st November 1860 at the New Synagogue, Great St Helens, according to the Rites and Ceremonies of the German and Polish Jews. Eve had been born in January 1841 and was the daughter of Abraham Barnett, Reader at the Synagogue at the time and later Minister. The Harrises in question are usually thought to have been of Russian or Polish origin: a family of the Jewish faith which settled in the East End of London and the City in the early years of the 19th century. William’s father seems to have been called Levy, and there was no lack of Harrises and Barnetts living in Great Prescott Street in the 19th century. Lionel was born in that street, where William and Eve were living (at Nº 14) when the 1861 census was taken. William at that time was a general merchant, according to his marriage certificate. William and Eve had a typically large 19th-century family. Lionel was the eldest son, according to the 1871 census, born in 1862. He was followed by Ernest, Eltaet? (a daughter), Morris, Violet, Stella and Norah according to the 1871 census, when the family had moved up in the world and were living at 43, Woburn Place with four servants. William was now a Diamond Merchant. There was at least one other daughter later, called Gertrude, whom Lionel mentioned in his will and who presumably died after him. Lionel had earlier, in the 1880s presumably, joined his father in South America to work in the textile business. It was William, apparently, who suggested that his son should move to Spain, and he can first be located in the Spanish capital in 1891. when he was trading as a diamond merchant (like his father), together with Alfred Lindenbaum in Madrid and London. In 1892 his letterhead gives his business addresses in both Madrid and London, but he was no longer in diamonds, and was dealing instead in antiques, art and jewellery. L. Harris & Co. was at Fuencarral, 24, Pr[incip]al D[e]r[ech]a in Madrid and 35 Hatton Gardens in London in the year in question. By 1896 his Madrid address had changed to Caballero de Gracia, 22, principal, and he had separate addresses for Antiques and Jewellery in London, at 127 Regent Street (with the telegraphic address BARMASTER), and at 23 Hatton Gardens (telegraphic address BRAWRONIA) respectively. In March 1898 his Madrid address was Carmen, 4, 1º izq[uier]da, and his London addresses remained unchanged. Since a diamond merchant called William Harris is listed in Hatton Gardens in the Post Office Directories of the period, it is not impossible that this was Lionel’s father’s business address. In Lionel’s early business activity in Madrid and London, it is evident that he needed the support of partners, and often changed them. He dissolved the partnership with Lindenbaum in 1891 and we have yet to discover when it had started. Subsequently he went into partnership with Solomon Joseph as Dealers in Works of Art and Antiquities at 127 Regent Street, trading as Harris & Co., and this arrangement was dissolved in 1898. Later, in 1905, a certain solicitor called George Solomon Joseph (very possibly Lionel’s former partner) is mentioned in The Times in a case where Lionel Harris himself was also involved, as executor of the estate of Louis Jephson of Brighton, whose will had been challenged. It seems that Solomon Joseph was a cousin of the deceased Jephson and that Lionel was a relation too . 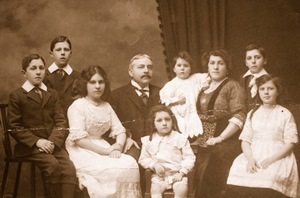 By 1911 five more children had been born to Lionel and his wife: three sons –William in 1902; Lionel Junior in 1903; Tomás Joseph in 1909 1908 ; and two daughters, Conchita in 1904; and Enriqueta Eva in 1910. The 1911 census shows that there were now six servants to support the growing family. Lionel’s art and antiques trading prospered. He was selling early 16th-century alabaster effigies, a large collection of ironwork, a Gothic figure, and Hispano-Moresque vases to the recently founded Hispanic Society of America in New York in the course of 1906, having offered a Spanish Apocalypse to them unsuccessfully in August 1901, and other purchases from Lionel were made by the same Society in the years up to and including 1914. The Victoria and Albert Museum purchased late 15th-century sepulchral sculptures from his firm in 1910 and he sold rare textiles and carpets and other works to them between that date and 1920. In the years before World War I, Lionel’s dealing in early Spanish paintings and El Greco also took off. The Mass of St Gregory from the School of Fernando Gallego, was bought from Lionel for the Fitzwilliam Museum in Cambridge in 1910 and an anonymous St Michael of the Valencian School was acquired by the National Gallery of Scotland from him the same year. The premises The Spanish Art Gallery at 50 Conduit Street became The Spanish Art Gallery at this period, admired by such art luminaries as Roger Fry, who wrote a strong appraisal of the originality of El Greco’s art for the Burlington Magazine in 1913, basing his opinions largely on four paintings by the master which Lionel then had on show. By the 1920s, Lionel’s sons were old enough to help their father with his business. Maurice Harris joined his father as a Director before 1921, probably at both the Spanish Art Gallery and 44 Conduit Street, known as the Kent Gallery Ltd. and so did Lionel Junior (the third of the four sons, born in 1903). The second son William may also have worked with his father too, but seems not to have become a director, and at some stage moved to Caernafon in Wales to run an antiques business of his own. It was in the late 1920s that Lionel’s youngest son, Tomás, decided to follow his father into art dealing, and he had galleries of his own first in Sackville Street and then at 29 Bruton Street before joining Lionel at the Spanish Art Gallery which he later moved to Garden Lodge, Logan Place, Kensington, W8. Tomás had won a scholarship at the Slade School of Art when he was only fifteen and was trained as an artist there from 1923 to 1926, spending a year subsequently at the British Academy in Rome. Although he had a prodigious talent and continued to paint and exhibit his work throughout his life, the family’s dealing in works of art stimulated his interest in collecting too. He began by seeking out prints and drawings by the two Tiepolos, Dürer and Rembrandt, and then turned his attention to Goya., building up an unrivalled collection of the various editions of the Spanish artist’s major series of prints and lithographs, and studying rare states of the etchings. In his will, Lionel made it plain that Tomás was uniquely suited to run the gallery, and the exceptional quality of the two exhibitions he organised in the 1930s, with major works by Velázquez, Ribera, Zurbarán and Goya and little known works from private collections, showed that he had the ability to develop the business further.Lionel’s own quality and reputation as a dealer was obvious in the 1930s. In an interview with him published in The Evening Standard in July 1938 he was compared to Duveen, although in reality in the field of Spanish art he seems to have outdone all his international rivals, since there is clear evidence that he had handled more important works by Spanish artists than any other dealer in the catalogue of Spanish Paintings outside Spain published by Juan Antonio Gaya Nuño in Madrid in 1958. Yet although Tomás and Maurice were actively trying to sell work from their father’s stock to major museums in the post-war period, it has been said that Tomás was ‘evidently trying to wind up his business’ then. And it may be that the stimulus to create, fostered by his house in Majorca, and his Goya collecting and the preparation of his Goya print catalogue left little time for dealing and selling. [Tomás’s Goya print collection, part of it now available for study in the British Museum’s Department of Prints and Drawings thanks to the generosity of his widow and his sisters, although the gift was also in lieu of estate duties, and his two volume Goya Prints and Lithographs (Oxford, Bruno Cassirer, 1964) have made a major contribution to the understanding of Goya’s etching and lithographic techniques, and have greatly increased the general appreciation of that part of the Spanish artist’s work. But historians may well be hard pressed to weigh the significance of his work as artist, collector and scholar, against the importance of his work for MI 5 during World War II, since he was the individual responsible for much of the planning and control of the Double Agent known as Garbo, and invented himself many of the spurious reports sent to this agent (and thence to the German High Command) from Garbo’s imaginary network of spies, creating an ingenious web of deceptions, that succeeded in keeping the Germans in the dark about the intended D-Day landings. Tomás wrote his own account of his role as Garbo’s full-time case officer in a series of World War II double bluffs, now in the National Archives at Kew, available in print with the title Garbo, the spy who saved D-day (London, Public Record Office, 2000). Marriage Certificate from the Registration District of the City of London. Certified copy obtained on the 28th October 2002. The fact that William was born in Germany is mentioned in the 1871 census in an entry identified by Morlin. Birth Certificate from the Registration District of East London and the sub-district of St Botolph. Certified copy obtained 29th October 2002. See Jeffrey Maynard, The History of the Bloom and Harris families (1989). Copy in the Local History Library in Bancroft Road, London E 1. Copy of the will supplied by the Probate Registry in High Holborn, originally registered at Llandudno. Probate was granted to Lionel’s son-in-law Ephraim Wolff, married to his daughter Conchita (whose given name was presumably inspired by that of her Spanish grandmother). Information about the Spanish side of the family from Dr Enriqueta Harris Frankfort. Lionel and Enriqueta Rodríguez’s marriage certificate could be found in the Overseas Marriages 1896-1900 section in the Family Records Centre in 2002. The entry in the Madrid registry, vol. 10 fol. 891, was photocopied for Nigel Glendinning in 2002 at the Family Record Centre and given to Enriqueta Harris. Information given in an article in the Evening Standard July 9, 1938, known from a photocopy formerly in the possession of Enriqueta Harris Frankfort. with additional material from The London Gazette discovered by Morlin. The term Barmaster is apparently used of local judges in mines who assess the quality of ore extracted. Information from letters written by Lionel to his father, formerly in the possession of Dr. Enriqueta Harris Frankfort. Transcript of the entry for the family in the census obtained by Morlin. [9b] Information from the archives of The Times obtained by Morlin . It seems that 44 Conduit Street had been called The Spanish Art Gallery as early as 1898, when the Empress Frederick visited it one afternoon in December that year, according to The Times. Transcript obtained by Morlin . Information from research in the Victoria & Albert Museum archives by Dr Marjorie Trusted and her colleagues. See Fitzwilliam Museum Cambridge, Catalogue of Paintings, I, Dutch Flemish French German Spanish, Cambrudge, 1960, Nº 708, pp. 210-211; and Juan Antonio Gaya Nuño, La pintura española fuera de España, Madrid, Espasa Calpe, 1958, Nº 56. Information deduced from research on works sold to the V & A carried out by Dr Marjorie Trusted. The prosperity of the family in the 1920s was marked by the move of their private residence from Lymington Road to the far grander Fitzjohns Avenue. It should be possible to establish further information about William in Wales starting from the recollections of those who knew him there, such as members of the family of Morlin , and Professor David Davies, who may additionally be able to throw further light on his relations with Enriqueta and other members of the Harris family. See Anthony Blunt’s article on Tomás in the Dictionary of National Biography, 1961-1970, Oxford University Press, 1981, p. 493. A copy of the will obtained from the Probate registry in Holborn in 2002 shows that Lionel knew that the assets of his business had been deprived of their true value by the war and the depression that preceded it, but hoped that they would recover their worth when the war was over. When he made his will he was particularly concerned to look after the female members of his family, although he also wished to continue to support the children of his son William: Gordon, Ronald and David, and a granddaughter called Maureen, who is yet to be identified. His estate was valued for probate at £56, 222 and 16 shillings, a not inconsiderable sum if multiplied by the appropriate factor to give an equivalent in today’s money. See An Exhibition of Old Masters by Spanish Artists at the Galleries of Tomas Harris Ltd, 29, Bruton Street, London W 1 (June 1931) and From Greco to Goya, Tomas Harris Ltd, The Spanish Art Gallery. 6, Chesterfield Gardens, 1938. The family seem to have lived at Chesterfield Gardens in the Mayfair area during the war, and it was presumably there that Tomás and his wife Hilda gave famously lively parties for their arty and secret service friends. Observation of Dr Marjorie Trusted. Information from Morlin based on references in the National Archives to the gift of Goya prints. See Javier Juárez, Juan Pujol, el espía que derrotó a Hitler, Madrid, 2004; and Christopher Andrew, The Defence of the Realm. The Authorized History of MI 5, London, Allen Lane, 2009. Many Thanks to Nigel Glendinning (Professor of art history at London University) for sending us the above document about my Harris Family. Nigel was good friend with Tomas Harris, and has known Enriqueta Harris for many years, right up until her death in 2006.